The return of winter means you’ll be spending more time in your home, but chances are, you won’t be the only one seeking shelter. 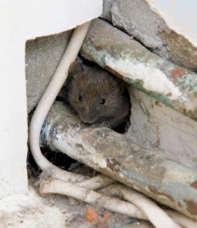 As temperatures drop, some of our most despised house guests – rats and mice – are busy searching for a warmer spot to sleep, and many will find it in a wall cavity, snuggled up in ceiling insulation or curled up behind a fridge. This can be a matter of concern, but there are ways of coping with them other than putting down anti-coagulant poisons, which can harm pets that ingest the poison or the poisoned vermin. Greasy fur marks – rats and house mice leave dirty black smears along well-travelled routes, particularly ‘loop smears’ where they squeeze under roof joints. If you believe you have a rat or mouse problem, then it’s important to do what you can to stop them both for your health and also for your safety. While there are common solutions such traps or poison, it’s important to be careful with these options. Rat poison is a bait — this works for rodents as well as pets. Also, most times the rats/mice die inside your walls, roof or in other areas that are hard to reach, leaving you with a terrible decomposing stench as a parting gift. A better option is prevention: make it harder for them to get inside and remove the incentive for such a move. Often, even seemingly impossible gaps can be enough for rats or mice to get in from the outsides. If there are any gaps or holes that aren’t actually there for a necessary reason, consider sealing them up. Other entry points – such as downpipes – can be blocked off with mesh. Pay attention to areas with over hanging tree branches, cables and pipes running up the walls. A mouse can get through a hole the size of a pencil, while rats can squeeze through a finger-width hole due to having very flexible bones. First thing all householders should do is check entry points and seal them up. Use a strong mesh (available from hardware stores) to block holes in areas such as the walls and eaves, rather than chicken wire which simply isn’t strong enough to keep a rat out. For smaller holes, steel wool can be used as it’s very sharp and they don’t like to gnaw through it, however it’s important to stuff it in quite firmly as a determined rat can still pull it aside. Repair broken air bricks and holes in outside walls, floorboards or skirting boards; tidy up cupboards and remove nesting material. You should also make an attempt to take away their food supply. 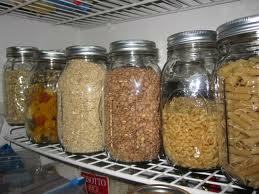 Don’t leave food out on the kitchen counter, and make sure all dry goods and grains in the pantry are stored in sealed, secure containers. For large infestations, or if rodents simply make you squeamish, consider hiring a professional pest control company. Coincidentally, this year I got a cat, and it’s also the first year that I haven’t seen any mouse activity in the pantry!